Frank Gehrke says that back in Missouri, where he was raised, snow was "something to be plowed." He would soon take a very different view. The Airborne Snow Observatory was a game-changer, says Frank Gehrke, California's former chief snow surveyor. 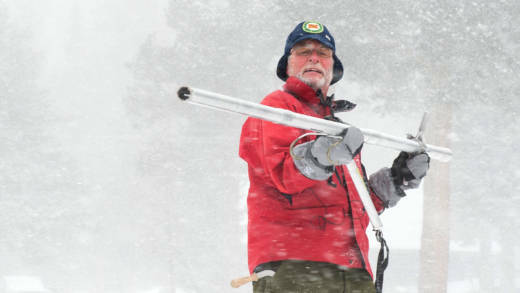 In December, Gehrke retired as chief snow surveyor for the California Department of Water Resources. He spent much of his 31 years with the department on skis and snowshoes, in remote corners of the Sierra Nevada, measuring the "frozen reservoir" that ultimately provides about a third of California's water supply. He was also the guy flanking Gov. Jerry Brown in late March of 2015, when there was no snow to measure and Brown announced sweeping drought measures. Shortly after his retirement, I met Gehrke near his home on the American River, for some reflections. The following is an edited transcript. What's it like not being involved in the snow surveys after all this time? It's a little bittersweet. But by the same token it's a relief not to have those worries about what could go wrong. What was it like to see the monthly surveys become a media event? When I first came to work for the department in 1987, there would be an occasional call from the media about when we were doing the survey. And then as things evolved in that first five-year drought, I realized that when the media brought their own snowshoes they were serious. It seems like the technology has really changed since you started in 1987. Well it has, and the real game-changer is what's known as the Airborne Snow Observatory. 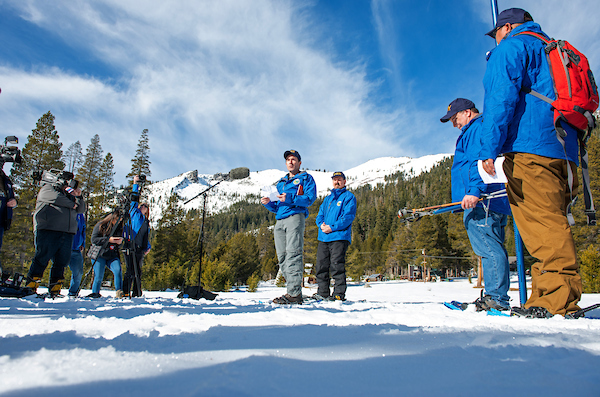 The first manual snow survey of the winter, conducted on Jan. 3, showed water content of the Sierra snowpack at just 67 percent of the long-term average, but that still beats last year at this time, when it was 31 percent of normal. Keep in mind the snowpack water content can change dramatically as the winter months progress. These are guys from NASA basically flying over the mountains in a plane, using light beams to measure the snow? Absolutely. We started that. 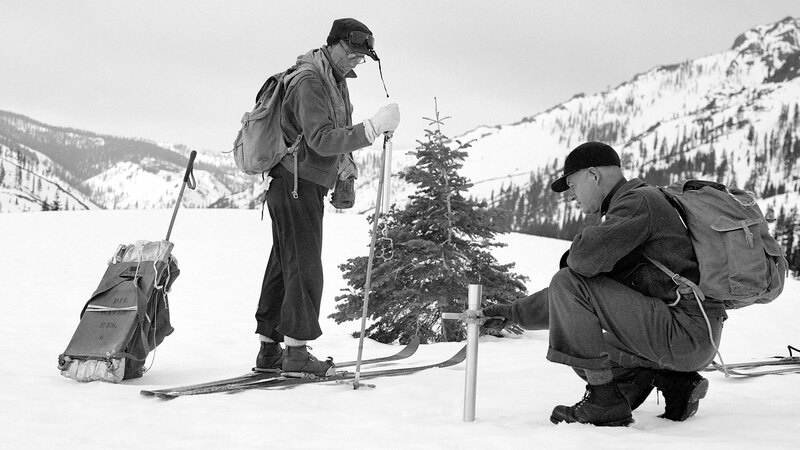 And that truly has been the huge change in all of the history of snow surveys. Being able to look at this basin-wide snow-water equivalent truly is phenomenal. And because we now can very accurately determine the snow in a basin, then we can start to look at some of the other factors that go into runoff prediction and examine those with the idea that the snow is now a known quantity. We're not guessing or trying to estimate. We know how much snow is up there. How important are these precision measurements? Well, they're hugely important, especially as things are changing. Predictions are for less snow, more rain, so being able to accurately determine where the snow is and how much there is makes a big difference in terms of your modeling for those short-term flood events, and also for more long-term water-supply forecasting. And it's also very important, for example down in the Tuolumne River watershed, where our highest ground-based measurement is at about 10,000 feet. Fully a third of the watershed is above that measurement point. So if you get into a spring situation where the snow has basically melted up to 10,000 feet, you're flying blind -- or you were prior to the Airborne Snow Observatory. And the ability to look at that, especially that late-spring runoff, can be extremely important for determining reservoir levels and managing that reservoir capacity for the benefit of both flood control as well as water supply and hydroelectric and a number of other benefits that you can more accurately monitor the reservoir and make intelligent decisions about releases. You've been doing this over the past 30 years. What changes have you seen in the snowpack? Actually not very much. We talk about the seasonal or inter-annual variability. [How California whipsaws between wet and dry years]. And those swings can mask perhaps a longer-term signal that's in there. The snow-course record, people look at it and they tweak it and some people see a signal, others don't. Do you worry at all about California's water future? Even now, there is a lot of water in California. But it doesn't come with the timing and the location of where we as a civilization really want it. That's where I think technology can do a great deal. We probably aren't going to be moving more water than we are right now; it's unlikely we'll be building any giant new pipelines or something. But what we'll be able to do is identify where the water is, when it occurs, and improve that accuracy. Here in 2019, we don't know what water the rest of the year is going to bring. And if we could improve that, even a little bit, it would go a long way toward being able to manage what we have right now in terms of physical infrastructure. How do they do the manual snow surveys? Find out in this video from 2010, when I trailed Gehrke out to Tamarack Flat in El Dorado County. Speaking of technology, when does skiing up into a pass and shoving aluminum tubes into the snow to weigh the water content become obsolete? I can see the number of surveys being reduced. But I think, at least for the foreseeable future, they're still what we use to verify everything else. Even though we have very advanced models, you still need that ground truth to ensure that something hasn't gone haywire.